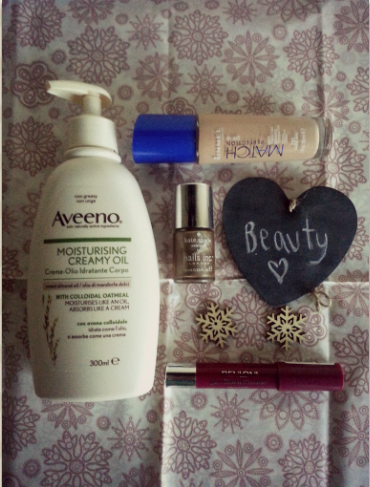 I've been loving the Aveeno Moisturising Creamy Oil throughout November. It's by far the best face moisturiser I've used and leaves me skin feeling a lot smoother. The smell is very mild and inoffensive and it absorbs really fast, which is a huge bonus. The bottle is nicely designed with a little pump on top making it easy to use. I wouldn't go as far as saying it's non-greasy like the bottle claims as, when I use it on my hands they usually feel pretty greasy. However, my face doesn't feel very greasy at all and so far I've not had any break outs so it's a winner if you have sensitive skin. I think the only draw back with this lotion is that it's slightly overpriced. Next up is Revlon's Just Bitten Kissable Balm Stain in 'Crush'. I used it in THIS tutorial and I really like it. It's a pretty, berry shade that's buildable so it's a good option if you're not brave enough to try bold, black cherry shades. The balm itself is fairly moisturising although I'd suggest using something like Carmex before hand if you're prone to chapped lips. The packaging looks good and is secure so it's great for just popping in your purse. I don't like the peppermint scent the balm has but it doesn't tend to linger. I would say the colour does fade a bit too quickly and it can sometimes be tricky to apply neatly because the nib is fairly chunky. I got an awesome freebie in the winter edition of Glamour magazine in the form of Kate Spade's Nails Inc nail polish. I chose the shade Uptown Glamour which is a nice mix of gold and silver. It has a metallic finish and is absolutely perfect for Christmas/Winter. It works really well as an accent nail; I've personally been pairing it with Barry M's Peach Melba - they make a fab combo! I'm tempted to go buy the other three shades. My last beauty favourite is Rimmel's Match Perfect Foundation. This has actually been a favourite with a lot of bloggers recently and I too have fallen for it. I prefer it to the Rimmel Wake Me Up foundation as it's a lot lighter. It's not heavily scented either so my skin isn't reacting to it as much. I've been using the shade 'Classic Beige' which is a little too orangey but I've been combating that with powder. Just like last month, all my fashion favourites happen to be accessories (oops). First up are two floral bulldog clips. I got these from Primark ages ago and kind of forgot about them. This month I've rediscovered them and they've been absolute life savers on bad hair days. I've used them to jazz up messy buns or bog standard poiny tails. I've also used them to great cute little hairstyles. They grip quite well and stay in place so they definitely get a thumbs up from me. Next is this adorable Little Miss Delicious necklace. Yes, that's right - Maxine got me hook ,line and sinker yet again. She released this cat necklace as part of the Halloween range and I couldn't resist. The irony of me being scared of cats was completely ignored and I've been wearing this proudly all month. 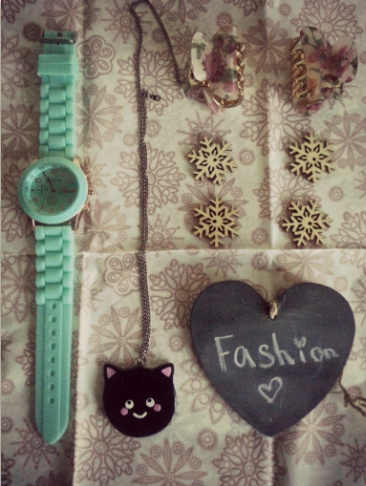 Finally for my fashion faves is a Silicone Geneva watch. It's a beautiful pastel mint colour with gold detailing and it looks great with most outfits. If you like the look of this watch then you are in luck as I am selling one just like it on my ebay account, as well as a few other bits and pieces. Check that out HERE. I tuned into Hollyoaks last month for the first time in years. I'd seen "Hollyoaks Blast" trending on twitter and decided to see what all the fuss was about. I've been hooked ever since and I've been watching it religiously. It's very unlike me because I tend to hate soaps but Hollyoaks has completely set the bar for the other soaps now. The acting is way better than I remembered it to be and the story lines are more creative and interesting. I'm personally excited to see how the Sienna story line pans out. You may recognise little Pusheen the cat from Facebook chat. I think she's adorable and I love her creator, Claire Belton. I pre-ordered the book I Am Pusheen the Cat as soon as Claire announced it's release on her Tumblr page, and it finally arrived this month. It's so adorable and light hearted. Definitely recommend this! I treat myself to a pair of new slippers this month. My old pair lasted me a good three years and were in much need of a replacement. I picked these cuties up at Next and I love them. They have a pink and white Christmas pattern on them and are lined with soft faux fur. 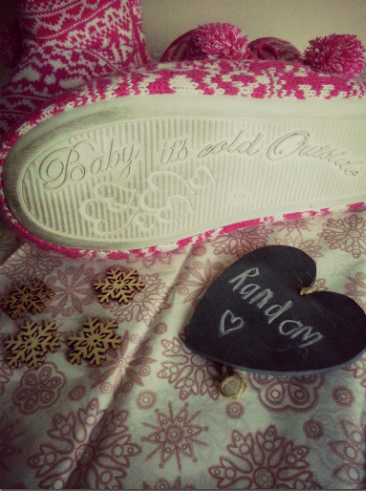 They have the words "Baby It's Cold Outside" embossed on the bottom which I think is adorable but as you can see it makes them super hard to clean! I got them in a small which is size 3/4 and they are so snug, cosy and warm - perfect for chilly weather. What have been some of your November favourites? Hello Steven. I'm proud to say I'm already a bible believing Christian and understand all the points you made. I will check out your blog. Haha I don't mind cos I'm a Christian too just thought it was a bit random. I'm gunna swatch the nails inc shade soon so people can see it in action properly.